The Marketing Department is pleased to announce that the November 2018 Marketing Update is now available on The Marketing Matrix! We’re grateful for all you do to support our students, their families, and your communities… you are truly “Changing Lives Through Math”! Keep up the fantastic work, and have an awesome November! The Marketing Department is pleased to announce that the October 2018 Marketing Update is now available on The Marketing Matrix! The Marketing Department is pleased to announce that the September 2018 Marketing Update is now available on The Marketing Matrix! In order to help you communicate with your prospects and customers, the Marketing Department provides professionally designed, easy-to-use email templates. We’re here to help you make the most of them! The Monthly Newsletter Template is fully customizable and is a great method to recruit and close leads, retain current customers, stay top-of-mind with teachers, and incentivize lapsed customers. Because it’s a Constant Contact template, you can send an email blast to any of these target segments—or all of them at once. We encourage the use of the graphics and blog stories we’ve provided, but you’ll definitely want to change the introductory text and the social media links to reflect your specific center location and your message. You can even add pictures of kids and Instructors from your center, so long as you have a signed model release. To change the text at the top (“News & Updates”), just click on the headline/text and use the WYSIWYG (“What You See Is What You Get”) editor to make changes. It’s super easy. Just make sure any new or changed text is consistent with the existing font. By default, the social media icons at the bottom link to Home Office accounts, but you can make these links point to your channels. Simply double-click on any of the social media icons, and the WYSIWYG editor that slides in from the left side of the screen allows you to change the URLs to your own center’s Facebook, Twitter, or Instagram account easily. Done and done! A good subject line is the key to getting people to open your email. Hubspot has a terrific blog post, How to Write Catchy Email Subject Lines: 19 Tips, which concisely lists best practices for creating compelling subject lines. This post is truly worth the short time it takes to read it. Once you’ve launched an email campaign, click on “Reporting” at the top of your Constant Contact page to view its statistics. This will help you to make adjustments to improve the performance of your subject lines and preheaders and to increase open and click-through rates. Please use the templates we’re providing to keep in contact with your unconverted leads, strengthen your relationship with current customers, and build mindshare with teachers and influencers on your email lists! Website traffic is a critically important part of lead generation for Mathnasium franchisees. The majority of our traffic comes from organic (unpaid) search, by way of Google. Our ability to get a high “ranking” from Google on organic search hinges on how well we play to the algorithm in their engine. One way we have traditionally played to Google’s algorithm is through blogging. Although blogging is the most powerful free method to increase our organic search ranking, blog copy must be original in order to lift, rather than diminish, our ranking. Google penalizes (“suppresses”) sites with duplicate blog content as much as (or worse than!) it elevates sites with original content, so we must run our websites with this in mind. In giving our website a thorough critical analysis, we discovered that too much of what we are doing is actually hurting our own cause. What’s on one microsite affects our Mathnasium site as a whole. We sink or swim together. In order to begin fixing this, the very first step we have to take is to minimize duplicate content. This means that, if you already have existing duplicate content on your microsite it can remain there; however, beginning immediately, any newly-posted duplicate content on the microsite blogs will be subject to removal. Mathnasium is at a critical point in its organic search practice. We are currently running neck-and-neck for the top spots on organic rankings with several of our primary competitors, so being smart about the way we post content is paramount. Create an original title for your post. Don’t use the exact title posted by the home office. Write a short introduction explaining why you think the article is relevant to your local readers; then, link to the article. Engage readers by asking for their response on a question or sharing a key takeaway from the post in your own words. If you want to copy a snippet of text from the original post to include on your own post, use quotation marks around the copied text. Quotation marks are how Google recognizes that the content is repurposed, not duplicated. No more than 20% of the author’s original copy should appear on your new post, even if it’s in quotes. Follow this same practice if you want to link to any other newspaper or website article from outside the system. Remember that posting fewer, high-quality articles is better than posting more articles that include duplicate content. Even if you only post once a month, following these best practices will bolster your efforts instead of diminish them! Write original content in your own voice and on-brand. Ideally, write posts of at least 800 words. This may seem long, but it makes a difference to Google! Incorporate keywords into your writing. Each month, when Marketing announces a new Monthly Marketing Update, we will also include 5-10 keywords for you to focus on. We strongly discourage hiring writers from outside your staff, especially if they aren’t already intimately familiar with Mathnasium, our brand, and the subtleties of our educational philosophy. Whether it’s a staffer or a freelancer who writes content, make sure the content is written solely for your center, that it hasn’t already been published elsewhere (even in part), and that you have exclusive rights to it, so that it isn’t sold later to someone else. If you’re concerned that an article you’ve purchased (or will purchase) may not be fully original, send it to us at support@mathnasium.com. We’ll run it through a duplicate content tool to determine the article’s originality. Of course, please do post news about your own center without being concerned about the length of your post. In this case, use a conversational tone and include plenty of pictures or video of your students (so long as you have model releases, available on the Marketing Matrix). Here’s where you can put your individual stamp on your blog, by showing your community the impact your Mathnasium Center makes on local students, families, and schools! Look for more on digital best practices in the future on Matters. The Marketing Department is pleased to announce that the August 2018 Marketing Update is now available on The Marketing Matrix! The Marketing Department is pleased to announce that the June 2018 Marketing Update is now available on The Marketing Matrix! Take advantage of this peak summer marketing period, expanding Center visibility and boosting attendance. Actively promote and engage in the “Flat Ace Around the World Activity and Social Media Contest”. Initiate relationships with new/incoming state and local PTA leaders. We will soon be releasing our Back-to-School materials. Stay tuned for more information in the weeks to come! Thank you so much in advance for participating in this survey. Your thorough answers will help us understand the effectiveness of the Math Night program, and its components, to help us serve your school marketing efforts better. Please CLICK HERE to complete this survey. Please complete this survey by Wednesday, February 7. If you have any questions, please email support@mathnasium.com. We thank you for your participation and feedback! February 2017 Marketing Calendar Now Available! In February, we’re celebrating our love of math all month for Valentine’s Day … while laying some serious groundwork for a successful summer 2017! We’ve spruced up the format of this month’s marketing plan to reflect this dual focus—follow it to boost your efforts and stay on top of your goals and objectives. Parents will soon start reaching out to you about summer programs—now is the time to start preparing for summer! Solidify your summer program offerings (pricing structure, hours, etc.) and pick one summer marketing campaign (Download Depot) for consistency. Boost visibility by pinpointing marketing opportunities in your community (summer camp fairs, summer issues of local newspapers/parent magazines, etc.) and getting involved. Ensure that you meet print deadlines by sending your summer print ads to targeted publications and design files for summer posters, banners, etc., to the printer in time for display in late February/early March. Share your Mathnasium story with your local media with our customizable press release templates! Our Love of Math press release template is full of tips to help parents facilitate learning opportunities that encourage their kids to appreciate and love math. Please reference the Generate Awareness: Engage in Public Relations microsystem in the Operations Manual for media outreach steps. 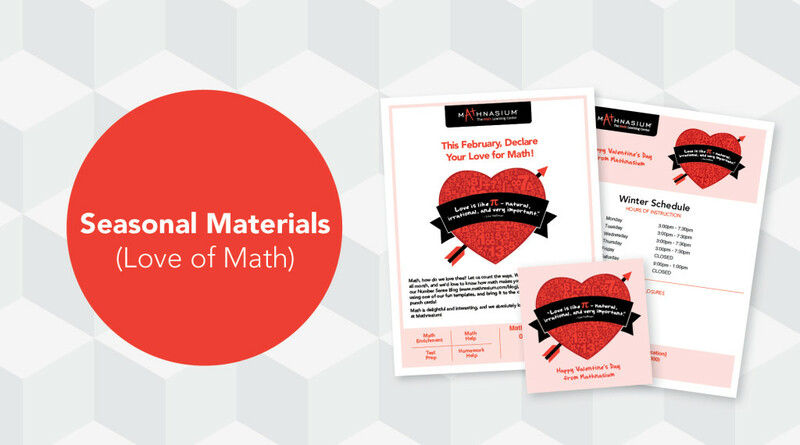 Lead-Generation Promo: “Declare Your Love for Math!” Math Valentines! This month, we’re encouraging parents to help their kids unleash their creativity, express their love of math, and come to Mathnasium for more inspiration! Our “Declare Your Love for Math!” promo features customizable math valentine templates (available on the Number Sense Blog). Kids use the templates to write/draw/paint about why they love math and bring their finished masterpieces to Mathnasium for a fun reward or extra punches on their punch cards. Note: Promo links go live on February 1, 2017. Use these supplementary seasonal materials to complement our full set of year-round Lightbulb Campaign marketing materials … all available on Download Depot! Update your microsite: List current hours of operation, offers, Lightbulb Campaign banner, free trial special offer, etc. Increase Center appeal: Consider trading existing branded storefront décor with alternatives. Freshen up your Center’s interior by replacing peeling wall art, attending to furnishings in disrepair, cleaning carpets, etc. Leverage social media to drive leads to your microsite. Also, feel free to share articles from the Mathnasium Number Sense Blog on your social media pages! Partner with schools: Schedule in-person meetings with school counselors or curriculum specialists at your local schools to understand their initiatives, goals, and needs. At this time of year, finishing the year strong and receiving adequate test prep (state and college entrance standardized tests, finals, etc.) are top of mind. Before the meeting, do your research—visit school websites, read school newspapers, research the school’s latest test scores, and review the PTA/PTO calendar for outreach opportunities. Please refer to the best practices resources for PTA outreach on Download Depot (most are applicable for building relationships with all variants of parent leader groups). 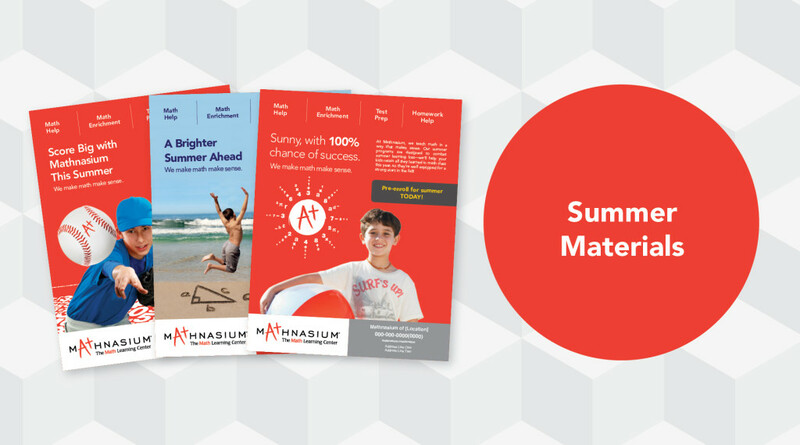 Mathnasium + PTA, STEM + Families, and Mathnasium + Parent Leaders marketing materials are also available. Reach out to classroom teachers: Visit the schools in your territory and hand-deliver the Teacher Flyer, placing it into their mailboxes yourself. If your local schools aren’t receptive to in-person visits, send a quick Teacher Email to all teachers. Engage in public relations: Customize our “Love of Math” Press Release and send it out to your press contacts. 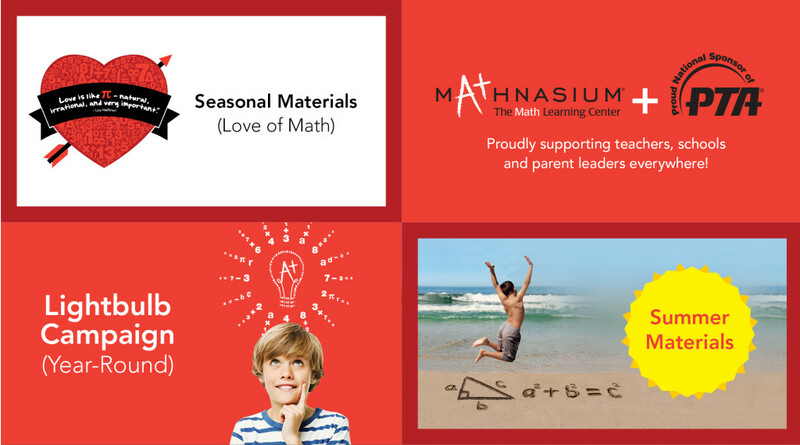 Send targeted February parent mass emails by February 5 and remind current, potential, and inactive customers that Mathnasium is here to help kids succeed by encouraging them to love and appreciate math. Customize and send out the February 2017 Newsflash newsletter template. “Declare Your Love for Math!” Math Valentines promo: Drive local engagement by promoting across social media. Leads/inactive customers bring in their completed valentines for a fun prize (something from your rewards cabinet, Mathnasium gear, or gift cards). Current students receive (at your discretion) extra punches on their punch cards or a fully completed punch card! Featured Marketing Materials—all available on Download Depot!